Dual-cure, self-adhesive, fluoride-releasing resin cement provides an outstanding level of adhesion to enamel, dentin, metal, lithium disilicate and zirconia. Stronger shear bond strengths - approximately 35% increase in dentin bond strength and 15% increase in enamel bond strength compared to the original formula. Faster light-curing time - a new Radical Amplifier increases the rate of polymerization, thus shortening the light-curing time. Quick and easy clean-up - a unique catalyst-controlled setting mechanism provides an easier clean-up technique with shorter chair-time. No need for refrigeration - boasts a stable 3-year shelf-life at room temperature. Contains: 1 x 8.0g (4.6ml) syringes, 20 mixing tips. 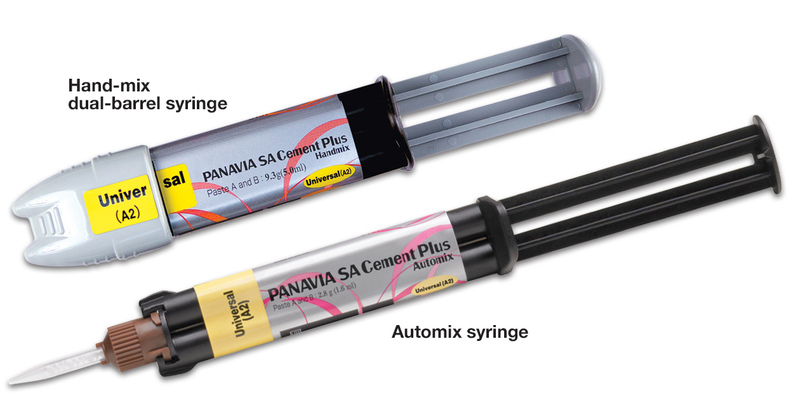 Contains: 3 x 8.0g (4.6ml) syringes, 40 mixing tips, 10 endo intraoral tips. Contains: 1 x 9.3g dual barrel syringe.